George Stewart was Emeritus Professor of Physics at the University of Iowa (1946-1956). Other institutional affiliations included the University of North Dakota. His research interests included acoustics and the structure of liquids. February 22, 1876Birth, St. Louis (Mo.). 1898Obtained AB, DePauw University, Greencastle (Ind.). 1901Obtained PhD in Physics, Cornell University, Ithaca (N.Y.). 1901 – 1903Instructor in Physics, Cornell University. 1901 – 1956Professor of Physics (1909-1946); Head, Department of Physics (1909-1946); and Emeritus Professor of Physics (1946-1956), University of Iowa, Iowa City (Iowa). 1903 – 1909Assistant Professor of Physics (1903-1904) and Professor of Physics (1904-1909), University of North Dakota, Grand Forks (N.D.). 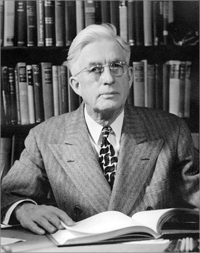 1944Member, National Academy of Sciences. August 16, 1956Death, Iowa City (Iowa). Co-wrote "Acoustics: a text on theory and applications." Obtained PhD (1901). Instructor in Physics. Professor of Physics; Department Head; and Emeritus Professor of Physics. Assistant Professor of Physics and Professor of Physics. Archives of DePauw University and Indiana United Methodism. Roy O. West Library. George Walter Stewart papers, 1899-1955. Supplement to the contributions from The Physical Laboratory of the State University of Iowa, 1855-1878. James W. McGrath intellectual autobiography, circa 1957. George W. Stewart American Journal of Physics obituary.